The 61st annual Grammy Awards will be handed out this Sunday. Elvis himself is not personally nominated for any award, but he’s the subject in a couple of categories. 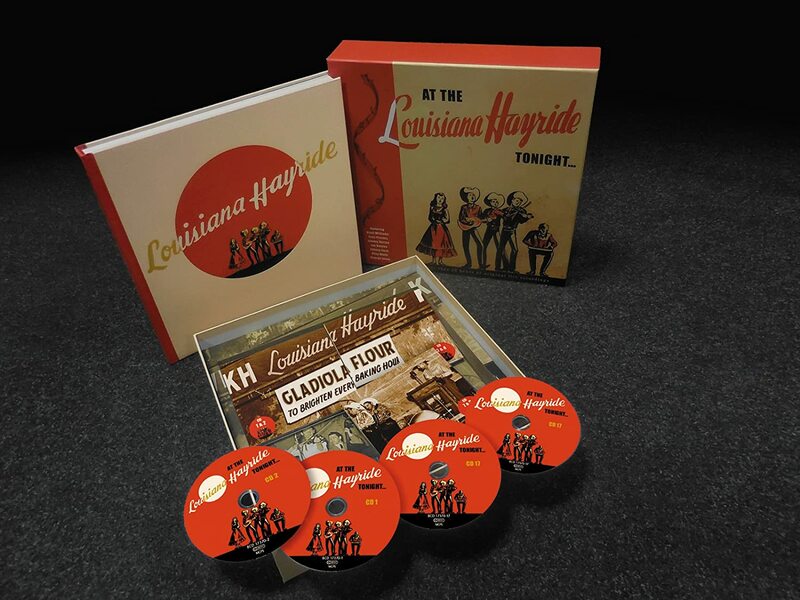 20 CDs comprise over 25 hours of music captured on-stage in the 1940s, ‘50s, and ‘60s at KWKH’s legendary Louisiana Hayride radio show. At The Louisiana Hayride Tonight – ,Staged live in Shreveport, the Hayride featured national country music stars, soon-to-be legends, regional break-outs, and talented newcomers. Most of this music has not been heard since the day it was broadcast. • 529 ‘live’ tracks including previously unknown recordings by Hank Williams. • 11 ‘as live’ studio-recorded transcriptions, including Kitty Wells, Johnnie and Jack, Hank Williams, and Curley Williams. • 19 studio-recorded commercial discs, including hits by Slim Whitman, the Browns, Mitchell Torok, Jim Reeves, Mac Wiseman, and Carolyn Bradshaw. • 167 artists in total, including Hank Williams, Elvis Presley, Johnny Horton, Webb Pierce, Faron Young, Jim Reeves, George Jones, Johnny Cash, Rose Maddox, Frankie Miller, Cousin Emmy, June Carter, Roy Acuff, the Bailes Brothers, the Oklahoma Wranglers, Norma Jean, the Browns, the Carlisles, the Louvin Brothers, Jimmy Newman, Ray Price, Roger Miller, Ferlin Husky, Warren Smith, Wynn Stewart, Grandpa Jones, Rusty and Doug Kershaw, Slim Whitman, and the Wilburn Brothers. These recordings are included on the Grammy-nominated boxed set. Listen to Elvis’ first performance at the Hayride on October 16, 1954. Here’s the complete track listing for this amazing compilation with audio clips. Forty years after the death of Elvis Presley, two-time Sundance Grand Jury winner Eugene Jarecki’s film takes the King’s 1963 Rolls-Royce on a musical road trip across America. From Memphis to New York, Las Vegas, and beyond, the journey traces the rise and fall of Elvis as a metaphor for the country he left behind. Of course, Elvis must be vilified. Here’s Elvis’ complete Grammy history. Watch Friday night for our second straight week of featured Grammy nominees. ← Jordan Fricke killed a Milwaukee police officer in cold blood. Now what?